Some DAB radios can play music from an iPod, but this mini DAB hi-fi from Denon does away with the need to connect a portable player. Capable of storing MP3s itself, it can even be plugged into a wireless home network and the internet to play music from virtually anywhere. The D-F103HRDAB comprises three separate products. Of main interest is the DAB module, better known as the DRA-F102DAB. 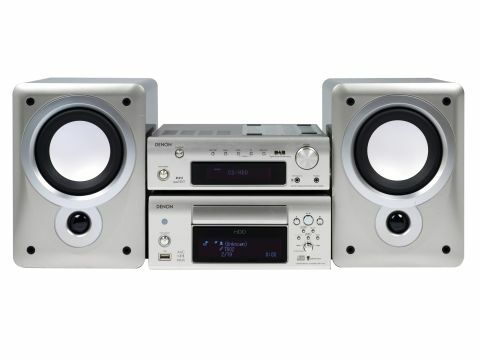 There's also a CD player, complete with a hard disk drive big enough for around 13,000 songs, and a pair of high-grade speakers - although you can buy the system without them, for £850. An optional cassette deck costs an extra £150. Around the back of the brushed aluminium casing there are plenty of inputs and outputs. You can plug in a record deck, connect a laptop's audio, add a subwoofer - whatever. But this hi-fi's key feature is its networking ability. Using an Ethernet port at the rear of the CD/HDD unit, you can access Internet radio and the Gracenote database of CD info, as well as play music from a PC or Mac. It's not simple, though, and setting up the system had us in a bit of a muddle. Cables everywhere - a real mess. A similar knot of wired aerials, one each for AM, FM and DAB, eventually gave us the bare minimum of DAB stations. A telescopic aerial is lacking, sadly, but at least it's easy enough to flick to other DAB stations. With no seven-day guide available, just about the only thing that this Denon can't do is record from the DAB tuner. Almost every other desire is catered for. While importing a CD - which is done at 8x speed by simply pressing a red button - the first track starts to play, then stops. We found that the system doesn't update itself mid-track, so if you play a CD while it's being imported, the next track isn't automatically selected. Although you can fetch MP3 files from a PC or Mac and store them on the HDD, CD-Rs containing MP3s can't be ripped. This system's reliance on dual remote controls proves to be its main drawback, however. Although they're interchangeable, using them for the first time is a bit like being blindfold in a fighter plane's cockpit. The DAB tuner's remote is based on those used in Denon's excellent Smart range, but too many dual-function buttons means it's easy to, say, start configuring a playlist when you meant to switch on the radio. Oops. Connected to the two speakers, the amp behind all this wizardry manages to pump out enough sound to fill a small room with some gusto. Its two 35W channels provide a lot of clarity, enough to reveal some previously unheard detail in some of the CDs we ripped, and, given the subwoofer output, certainly enough for it to form the basis for an multi-faceted 2.1 home entertainment system. This versatile product is unlike any mini hi-fi we've seen before, in that Denon has tried to make it future-proof, backwards-compatible and, in spite of the many features, user-friendly. It almost succeeds.